Some of you attended the emotional and at times distressing presentation by Juan Vicente, based on his book, “Spain, The Summer of 36”. In the book, he re-counts the stories and experiences with which he grew up, told to him by his father and then later by interviewing current survivors. Some of us then visited the village for a guided visit by Juan Vicente – quite harrowing. After the visit, I asked J V to enquire from the Mayor, whom we met on the visit, if there is a charity to which we could make a donation. It seemed right, that 80 years after the civil war, we could contribute to help make the lives a little better for those experiencing hard times. AMIDIS is a charity which helps and supports families with children and some adults who have both physical and mental problems. They offer respite to families and different therapy’s, including physiotherapy, horse-riding and psychological help . Many of the families are unemployed and cannot afford such help to their offspring or family members. I went to meet the President, Lola, who has a disabled son, now aged 16. She is a wonderful woman and achieves a great deal. She is helped by another Mollina man, Norberto, who has a disabled son and also by a young Argentinian couple who have the local Pizzaria. They have a healthy young daughter, but devote much of their time to help this cause. They make a good team and have a happy, positive outlook. 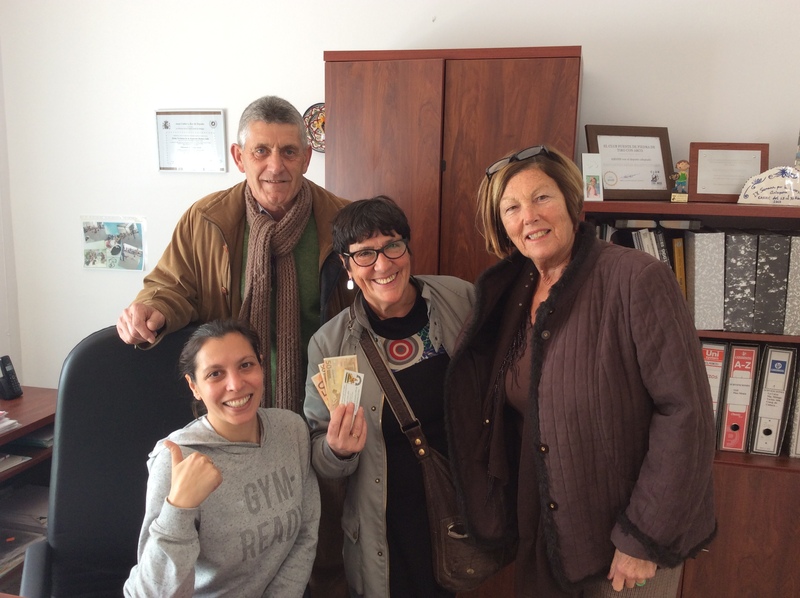 NHG made a donation of 200 € with which they were very happy. Yesterday, I received an email from Juan Vicente, to say that he had met Norberto and had also heard from other villagers about the donation and that they were very appreciative. I hope that we may be able to raise more funds. There is a photo below of Lola with the cash ! Very many thanks to all of you.